Easy maintenance, less power consumption. No Guide Rods: Completely avoiding the numerous problems existing in four pillars molding machine. Such as frequent rod lubrication、mould leakage and difficult mould change, which was caused of the wearing out of guide rods and bearing set. Separate drive cylinder with lock cylinder, by using one cylinder of DN80 to drive movable plate and four cylinders of DN100 to lock movable plate, instead of only one or two (DN25/DN140) for both mechanical actions. The clamping force is thus increased by 60% and movable speed is increased by 30% as well, while the hydraulic power reduced from 7.5Kw/5.5Kw to 4Kw/3Kw. Less steam consumption. Low product rejection rate. The steam supply is accomplished by PID system. By using Fang Yuan patent sensitive pressure control and large flow steam system, requiring steam pressure 0.10～0.15Mpa only, and the tolerance stays within +/-0.1bar.which realize the so-called “Large-flow” & “Low-pressure” steam system. Compares with normal molding machine, the heating time is saved by 30%, and the energy consumption is reduced by 30%-40% as well. One Kg raw material only consumes 8-12kg steam. 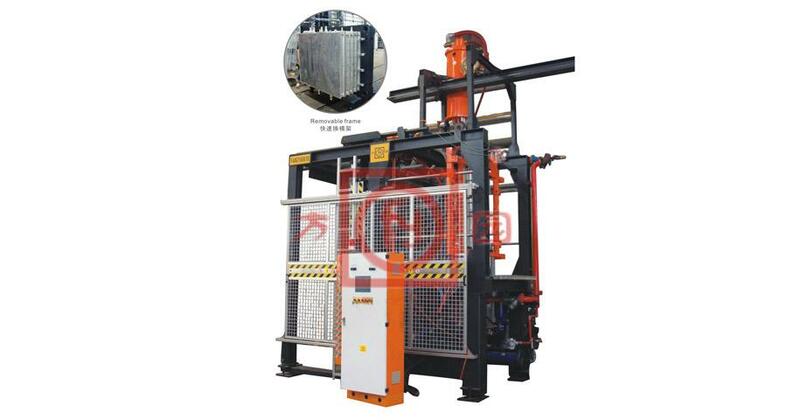 One extra mold support frame is required, all mold filling gun, ejectors will be fixed on mold support frame completely, then stop machine for exchanging mold support frame, which will same change mold from normally 6-8 hours to 1-1.5 hours. With special design for vacuum system, the vacuum system is very efficient, same as E and T type, this machine will use vacuum as main cooling, After 8-12s water cooling water content of product will be less than 10% (if more than 3 units machine, the central vacuum system are recommend). All pressure adjustment are remote controlled on control box, such as cross steaming Main steaming, Filling pressure, De-molding and air cooling pressure. It is easily operated. In addition .The hydraulic pressure can be also adjusted in touch screen according to different foaming area. All control parts 、electric parts、valves、gauges and hydraulic parts adopt famous international brands with high quality, which obtain stable and smooth running. 6. Note: As for FQ type, it is integrated chamber with machine (base on F type machine).